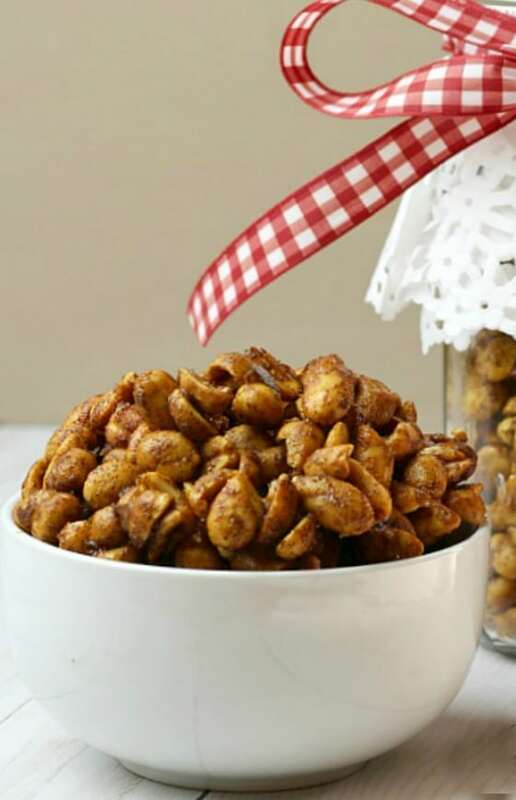 These Toffee Candied Peanuts are perfect for snacking on during the day when you just need a quick pick me up or for serious noshing while you watch the big game. This is also a great snack for gifting during the holidays. It’s something a little different from the usual cookie plate. 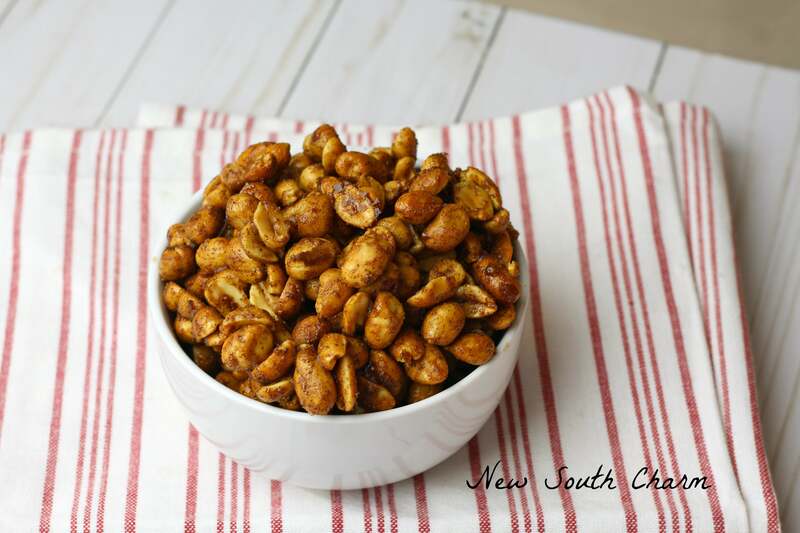 I’ve made these a few times and I highly recommend buying dry roasted and salted peanuts. In my experience the toffee topping seems to bake on to them better than the classic or cocktail variety. To make the toffee topping you simply mix together butter, corn syrup, cinnamon and nutmeg. Then toss in the peanuts stirring until they are well coated. 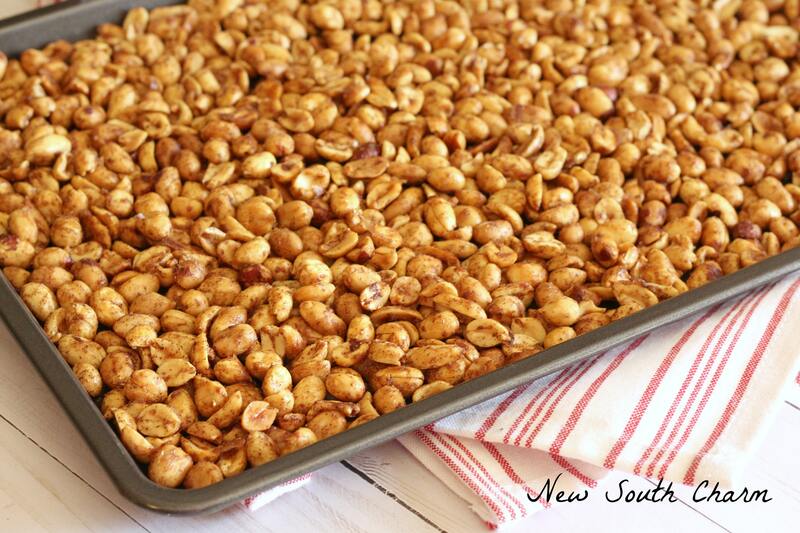 Spread the peanuts out in a single layer on a rimmed baking sheet and place a 300 degree oven for 20 minutes stirring once half way through. At the end 20 minutes remove from the oven and place the baking sheet on a rack to cool. When the peanuts are completely cooled lose them with a spatula and store in an airtight container. I love giving simple homemade gift to friends during the holidays. It’s one of my favorite ways to spread holiday cheer. 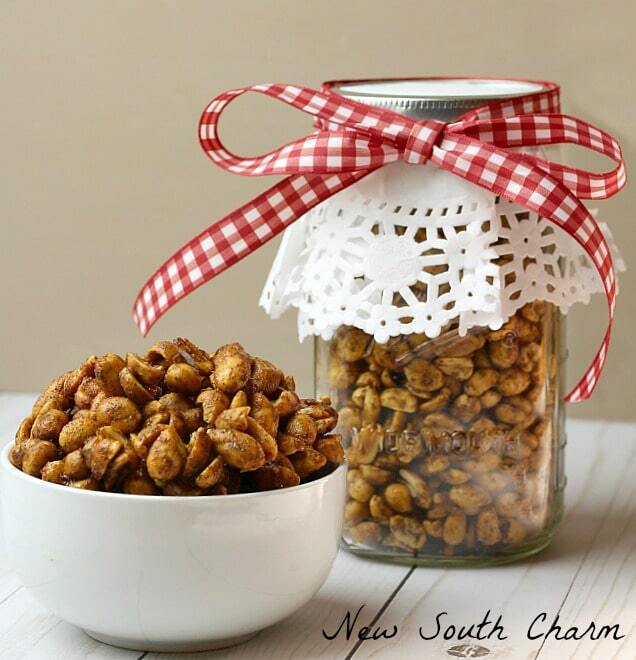 To gift these Toffee Candied Peanuts I poured them in a large mason jar to keep them fresh. Plus, once the jar is empty it can be repurposed for tons of things. To dress the jar up a little I tacked the ribbon on the lid leaving it open in the middle. Then I tied a simple bow. For the paper cover used a six inch paper doily and then screwed the ribbon covered lid over the top. Ta-dah! Easy and festive! 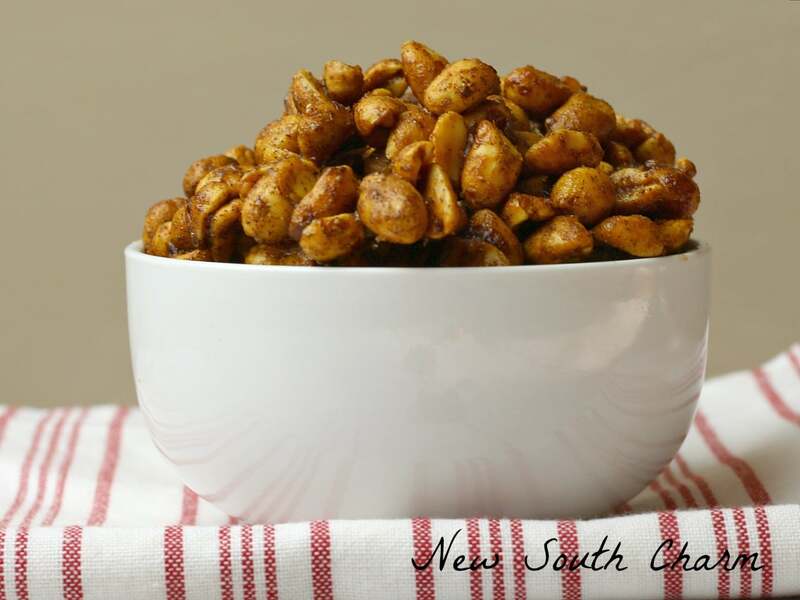 Toffee Candied Peanuts are a great snack for you or gifting to a friend this Christmas. If your looking for more FANTASTIC treats to enjoy and share this Christmas season check out these ideas and recipes from my Sunday Supper blogging friends. I love peanuts. Toffee sounds like a delicious idea for a coating! These look fantastic. I would love to get a jar of these for a gift. Oh my! I would love to receive a gift like this. I love having a snack like this a little bit after dinner. 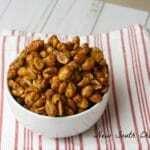 I’ve been looking for a candied nut recipe – Thank you for this! My neighbor is a flight attendant and she keeps me stocked in a dry roasted nut mix. My freezer is full of bags and we’ve made a pact to give away a nut mix for the holidays. This looks like our project!!!! Oh, yum! I know my family will love these candied peanuts. I also think these would make a great gift for my neighbors. Yummy! I am making these for sure. My family would love these. Thank you for sharing at Dishing it and Digging it link party. Hi! I made these this evening and they were super easy and super delicious!! A great alternative to cookies and so less time consuming! Will make a great homemade gift! Thank you! !